The commercial drone industry has a new best friend, and that friend is powerful and loaded. It's Google, which recently unveiled to The Atlantic its secret drone delivery program, Project Wing, meaning another tech titan now has skin in the commercial UAV game. 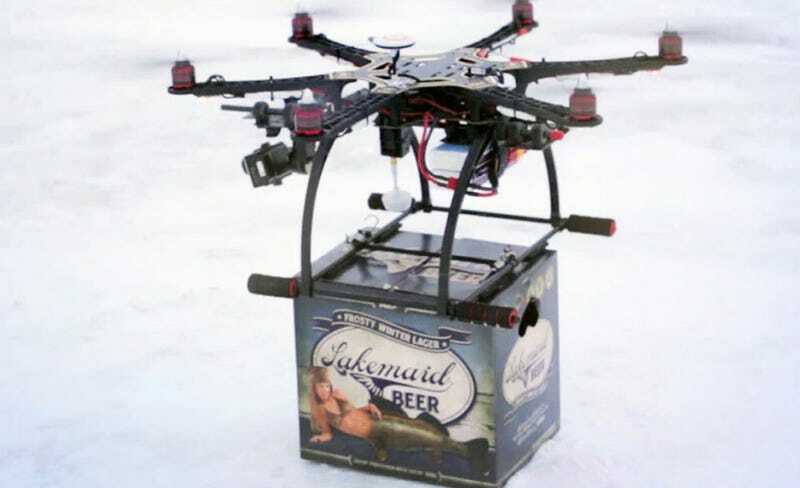 One that might just have enough clout to make delivery drones happen. This is very good news for drone entrepreneurs, who are currently for the most part innovating outside of the law. Commercial drones of any kind are banned by the Federal Aviation Administration—under basically the same reasoning your mom gave you as a kid, "because I said so"—unless approved on a case-by-case basis by the agency. Amazon requested federal approval earlier this year after it announced its delivery drone plan, which was mostly dismissed as a publicity stunt. Google is different. If it wants to build an army of airborne delivery robots, it will build an army of airborne delivery robots. The FAA told me that Google hasn't requested permission yet, but it has hired a lobbyist firm (the same as Amazon's, in fact) to influence policymakers to clear the path forward. It already spent $40,000 on drone delivery lobbying in 2013, Motherboard reported. There are millions more where that came from. In fact Google's already using its war chest to influence policy around another fleet of autonomous vehicles: self-driving cars. If Google dips into its deep pockets to lobby for a legal framework to integrate what it's calling "self-flying vehicles" into U.S. airspace, it could fast-track the process, especially with Amazon and other drone businesses at its side. A new Indiegogo campaign to tell the FAA that drone businesses should be legal to promote innovation. "Google has a history of effective lobbying in Washington on behalf of new technologies, so it is quite possible that its involvement in commercial drones will help accelerate the regulatory process," commercial drone lawyer Brendan Schulman told me. "I think with each major company that announces a drone program, the public starts to think of drones differently; not as controversial killing machines but as tools that can bring commercial and humanitarian benefits to all of us." Google's already singing a similar tune. In a fact sheet about Project Wing, the company pointed out that integrating autonomous machines into U.S. airspace will boost the economy by at least $13.6 billion in the first three years, and in 10 years could add as many as 100,000 jobs. To be clear, even if Silicon Valley influence helps tip the legal debate in favor of commercial drones, autonomous flying robo-postmen are at least a few years away. As mandated by congress, the FAA plans to issue guidelines for commercial drones by the end of next year, and that's assuming everything goes according to schedule, rarely a safe bet in Washington. Schulman said the rulemaking process has actually been in progress for a decade, but has moved "very slowly," despite "tremendous demand" recently. "It's gonna take conversations with the public and with regulators," Google X director Astro Teller told the Atlantic. "But so far in the conversations we've had over the last two years, and more intensely over the last couple months with regulators, I'm cautiously optimistic." It will probably take that long to perfect the technology anyway. Right now Google's testing its drones in Australia and Amazon's testing in India, where airspace guidelines are much less stringent than here in the ol' land of the free. Prototypes have successfully delivered candy, water, radios, and dog treats to a couple of farmers—it's not too far a stretch from there to dropping off your Subscribe & Save popchips. Google says it expects "it will take years to develop a service with multiple vehicles flying multiple deliveries per day." The question is: Once the fleet is up and running, how long until it's legal?